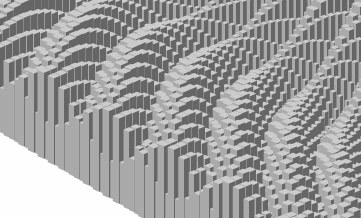 I was just wandering around on some flash blogs when I found this post on bit-101 that reminded me of an old fetish of mine: isometric representations! So I just wrote this demo… The best result is achived when staring at it for a couple of minutes cause it changes conformation very quickly and displays a lot of different patterns. No source code here, just a quick post after a while, but I wil be on the subject again (with source code). That’s really nice. Fast too. Good work. I also saw the bit-101 posts and had a quick go at some isometric stuff, but it’s not nearly as impressive. I look forwards to seeing the source for this.